Surface water sampling was carried out in the beginning of June and end of October 2012, during both low flow and high flow periods. The surface water samples were taken in section of rivers with moderate stream flow velocity, standing downstream of the sample collection point and collecting the samples upstream to avoid disturbances. 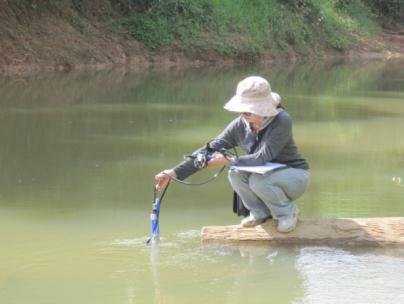 The quality of surface waters in Nam Ton watershed is generally good. The physical, chemical and biological characteristics are in compliance with standard when standard exists. The pH values ranging from 6.42 to 7.66 both in the high flow and low flow period, are acceptable. The pH results at sites SWS03, SWS06 and SWS11 were acidic in the high flow period but were less acidic in the low flow period. 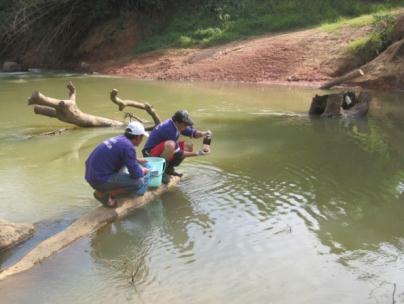 The temperature of four sites are suitable for fresh water animals according to the Thailand Pollution Control Department (PCD), with temperature values between 23-32◦C. There is a clear difference in conductivity between the high flow and low flow periods. Levels of conductivity at all sites were higher in October. The conductivity of the surface water at four sites was slightly high ranging from 45 to 100 µS/cm. This means the Nam Ton contains small amounts of dissolved ions and dissolved salt. The result of Dissolve Oxygen (DO) both in the high flow and low flow period at site SWS03, SWS06 and SWS11 were high,except site SWS13 were quite low which is likely because the water in the irrigation pond is stagnant and had high temperature and vegetation. The concentrations of Dissolve Oxygen at all sites were higher in October. Total dissolved solids consist of organic and inorganic (such as nitrates, sulphates, and carbonates) substances dissolved in water. The most common chemical constituents are calcium, phosphates, nitrates, sodium, potassium and chloride, which are found in nutrient runoff, general stormwater runoff and runoff from areas where pesticides are applied. Certain naturally occurring total dissolved solids arise from the weathering and dissolution of rocks and soils. The values of TDS at four sites both in the high flow and low flow periods were all 0 mg/L which indicates that there is no impact from agricultural, residential runoff, and point source water pollution. The turbidity of surface water in the high flow and low flow period ranged from 18.6 to 140.7 NTU and 8.3 to 13.98 NTU respectively. The results of turbidity levels showed a clear difference in turbidity between the high flow and low flow period because the first field trip was conducted during the wet season, with rains every night before sampling. The water of Nam Ton River was turbid which can affect water quality. On the other hand, in October the rainfall was less frequent. There is no standard for Ammonium. However, the values of Ammonium at four sites were very low which is because there is little decaying organic matter collecting on the bottom. The levels of Ammonium at all sites were higher in June. For chemical parameters, all parameters are in compliance with the Lao standard and do not indicate any significant effect from existing mining operations within the Nam Ton catchment area. Although Cobalt and Chromium do not have any standard to compare with the results, the level of those metals were extremely low which do not indicate any significant effect to the environment and aquatic life. 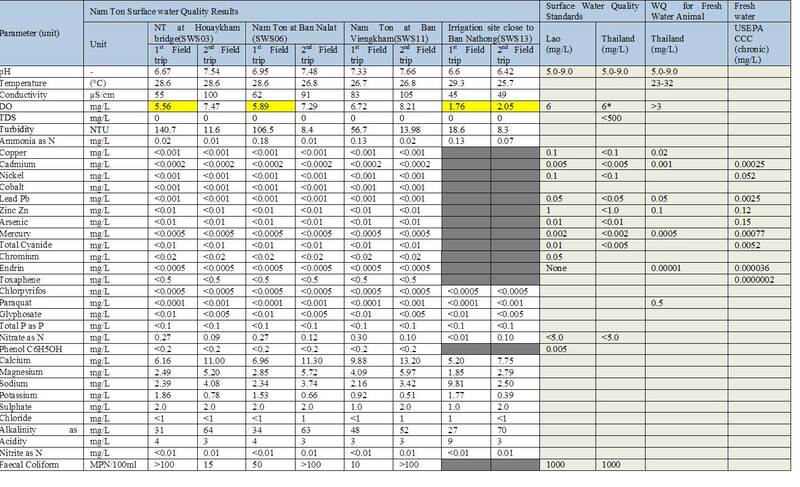 For analysis of other ions including Ca, Mg, Na, K, SO24, Cl and NO2, the values of these parameters were low and do not indicate impact onthe environment and aquatic life. The concentration of Ca, Mg, Na and NO2 were higher in October. On the other hand, the concentration of Potassium and Nitrate were higher in June. The results of Alkalinity in October at all sites were higher than in June. On the other hand, Acidity values at all sites were higher in June. There is no Lao standard for a number of pesticides parameters including toxaphene, chlorpyrifos, paraquat and glyphosate. However, the results of these pesticides both in June and October were below instrument detection levels at all sites. For endrin lab results, the detection limits of the laboratory method used for analysis is <0.0005 mg/l which is very low or non-existent levels. Faecal coliform at three monitoring sites were in compliance with the standards. Due to difficulties in the logistical chain, the holding times for the samples were exceeded in this case.